I’m Mother Diana Jacoba, the Founding Magistra of the Companions of Dorothy the Worker. I am also a member of the Third Order of the Society of Saint Francis and a deacon in the Episcopal Church, Diocese of California. My passion is spiritual companioning of folx who long for a connection with God and the Church but haven’t felt wanted or safe. My joy is promoting ethical ministry in the queer community and supporting others called by God to this ministry. It is my privilege and responsibility to witness to the Church the real needs of the people I serve. As non-stipendiary clergy, I make my living as an early childhood educator. I am the mother of 3 adult children and have occasional gigs as a clown. 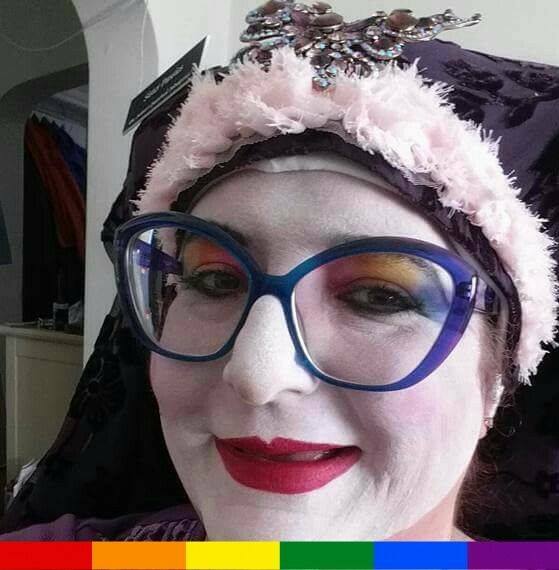 I am blessed to be a saint of the motherhouse of the Sisters of Perpetual Indulgence, a member of the Ducal and Imperial Councils of San Francisco and I work with many other community groups to promote safety in our neighborhoods and raise money and awareness for small nonprofits that serve the community. I look forward to the continuing growth of our Companions and that through our work we may smooth the path for those trying to find their way back to a faith that is their birth right. Sister Marie-Noelle is a founding Companion of CDW. She was born and raised in San Francisco, eventually moving to Cuyahoga Falls, Ohio then returning to San Francisco where she has lived since 2000. She works in a law firm that specializes in estate planning as a Legal Secretary in the Financial District of San Francisco. In addition, she serves as the treasurer for CDW. She is also a member of the San Francisco House of Sisters of Perpetual Indulgence, serving as the 2019 Board Chair, and various other roles with the Sisters in the years prior to becoming fully professed in December 2013. The Reverend Father Alan Robert Young has, for seemingly an eternity sought to formulate questions that test the limits of understanding, and deliberately lead to periods of deep reflection. After a successful career in behavioral health specializing in treatment of forensic populations as well divergent communities affected by HIV, Fr. Alan entered seminary to better assist those whom he would serve in finding more profound ways to articulate the questions of personal and communal urgency. While in seminary, he was invited to the enthronement of The Most Reverend Rowan Williams as the 104th Archbishop of Canterbury. In the following year while engaged in theological research of The University of Oxford Fr. Alan came to understand the urgency of the application of queer theory to Christian Theological Doctrine and Constructs. After exposing the limitations of a seminary education, Fr. Alan earned a MA in Leadership from New College of California. Upon return to seminary and through the completion of his MDiv, Fr. Alan spent a great deal of time with Mother Diana engaged in ministry in the community. Ordained a priest in The Old Catholic Church, Fr. Alan is also a founding member of the Companions of Dorothy the Worker. He currently resides in Fayetteville, Arkansas where he is responsible for the academic formation of Old Catholic postulants as well as engaging in further doctoral level research and developing a new ministerial presence in and beyond North West Arkansas. Simon Dinglasan is a founding Oblate member of CDW. They were born in the Philippines and were raised in New York City, eventually moving from Portland, Maine to San Francisco where they have lived since 2007. Simon works with Lutheran Social Services as a Program Coordinator at a supportive housing site in the Mission neighborhood of San Francisco. In addition to supporting the ministry of the Companions in practical ways, they are also a spiritual director and meet with folks on a monthly basis to companion them on their journey of nurturing a deeper intimacy with their spirituality/higher power/connection to the Universe/sense of self. Brother Tikhon is a founding Oblate member of the Companions of Dorothy the Worker. He was born and raised in Southern California. However, except for six years when he attended an Eastern Orthodox seminary and a Roman Catholic university in Pennsylvania, he has lived in the San Francisco Bay Area for most of his life. He is a Benedictine solitary. He has dedicated himself to following Christ through a contemplative vocation and ministering to others through prayer. He serves CDW as a counselor on CDW's "Aunt Dorothy's crisis line phone". Jeremy Whitner is a Companion of the CDW. Located in Charlotte, NC, Jeremy was initially raised as a Southern Baptist. Upon realizing that he was gay as a teenager, he journeyed through several denominations until he found himself a home in the Christian Church (The Disciples of Christ). He is currently attending Union Presbyterian Seminary in Charlotte to obtain his Masters in Divinity and is in process for ordination with the Disciples of Christ. His undergraduate degree in psychology is from Belmont Abbey, a Roman Catholic college. He is currently student pastor at Open Hearts Gathering and a founding member of the Queen City Sisters. Jeremy has a passion for interfaith and social justice issues. When not in ministry, he works in education, most frequently helping people with special needs. He is also a CDW formation counselor. John grew up on a wheat farm in North Central Washington State, far from his current home in metropolitan San Francisco. He's a seminarian within the Evangelical Lutheran Church in America and works with The Gubbio Project, sheltering and chaplaining unhoused folk in the city as he continues his formation and discernment. He also serves as a Ministry Assistant with the San Francisco Night Ministry and previously completed a Chaplaincy Residency at John Muir Health in Concord, CA. Prior to seminary, John completed his BA in Spanish and Performance Studies at Dartmouth College and served as the Executive Director of a regional legal aid program in Washington State. His favorite ministry experience to date involves offering spiritual care while in drag at a taco truck. A precious part of Angie McLachlan’s heart is in the Castro, a place inhabited still – albeit in spirit, by the poet, ‘Crip-Gay Activist’ and self-confessed ‘Café Queen’ Christopher Hewitt, her cousin. Angie learned how to be a priest in the 1980s as a Lay member and worship leader at Metropolitan Community Church Bournemouth, by watching the inspirational pastor. At that time, MCCB was the largest LGBTQ church community in Europe; pastored by Revd. Neil G. Thomas who is now Senior Pastor at Cathedral of Hope in Dallas Texas. As an Embalmer by profession, Angie’s ministry beyond the church walls was soon to focus on helping to raise funds and supporting the much needed AIDS Hospice ‘Sanctuary’ – and in gifting professional care as and when required. Angie holds a copy of the Sanctuary Memorial Book in her Sanctuary. Revd. Neil was at the heart of showing the care of Christ in action, through service with love. Eventually after completing seminary study, Angie was Ordained into the Liberal Catholic Church International and was, in time, selected to serve as Bishop of the Province of Great Britain and Ireland. She has a BA Hons in Death Loss and Palliative Care and an MA in Religion, alongside Diplomas in Embalming, NLP, Foot Healthcare Practice and Theosophy. Retired from the funeral service, Angie now works as a Cultural Interpreter, specialising in death. She teaches trainee funeral providers and Soul Midwives/Death Companions how to care for those who are at end of life and who have passed. She invented a training aide Ichabod Smith, a ‘death dummy’ to assist her in this ministry and always manages to place a focus on LGBTQI folk somewhere in her training sessions… having ‘Come Out’ 34 years ago and identifying as Gender Queer it seems rude to her not to be able to educate, support and celebrate our glorious diversity at all stages of life! The study of mysticism, world religions, meditation, prayer and contemplation fill Angie’s days, aside that is from her wife Catherine and elderly ‘selectively deaf’ dog Ozzie. I have been privileged to act as the Protector of the Companions since their inception, holding responsibility for the pastoral care of its members, vouchsafing for their stability and security to the broader church, and acting as their court of final appeal in cases where their founding documents don’t yet help them achieve resolution to new challenges. I come to the Companions with 25 years experience as a professed member of the Brotherhood of Saint Gregory, a religious community in the Episcopal Tradition. After 20 years in vows, I disclosed my truth as a transgender person and have navigated the questions and challenges posed by that identity in both my community and the broader church. I am a spiritual director for over 20 years, a published author, queer activist, and also a title holder in the Imperial Court of San Francisco, having served as Imperial Crowned Princess for 2018-19. I have served the queer community as a spiritual companion almost the entirety of my adult life. I am the current Sacred Space Minister for San Francisco Night Ministry, acting effectively as a Chaplain for the queer communities in the Castro, Tenderloin, and SOMA districts in San Francisco. I also work for Trinity+St. Peter’s Church as an Administrator, and also for Church Publishing, Inc. both as a support specialist for liturgical products and as a writer in their pool of authors. Spiritually and politically, I am a Christian Anarchist, and theologically deeply orthodox believing that it inexorably leads to an expansive vision of love.